It's true that our own thoughts as well as the words of other people can deceive us and can hold us captive when we dwell on them. It's also true that the evil one's accusations are a pack of lies and while we know this...we often let negative thoughts replay over and over in our heads. This is where the old saying, "Sticks and stones may breaks my bones, but words may never hurt me" falls apart because while we can get the sentiment it's clearly not true! Why? Because while bones heal up...words often stick with us and take longer to heal from especially when we allow them to replay in our thoughts! When is the last time you lost sleep or felt anxious because of negative thoughts or negative words spoken to you that you allowed yourself to dwell on for longer than you should have? How did that benefit you? Did it change anything or make things better or did it cause further negative thoughts to build upon the already negative thoughts? 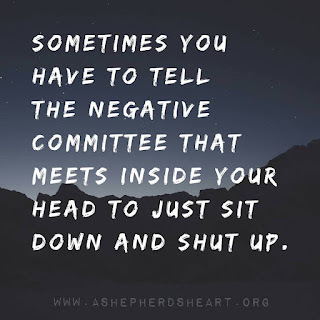 Speaking from experience, as I'm often a "chief over thinker", there has to be a time when you tell the negative thoughts to clearly SHUT UP because you and your mind are The Lord's and your thoughts or the thoughts of others, or the accusations of the evil one...will not have dominion, ownership or touch you because you are a child of God! It's like the "get behind me satan" moment and in your case, you seek the help of the Lord and ask Him shut the mouth of the lion who prowls about seeking to devour you!! That may seem dramatic to some but it's clearly written in God's Word that your enemy, satan, is seeking to devour you so take it seriously! You need to remember this and stay alert because the evil one would like to see you crippled by negative thoughts or stressed, anxious, oppressed and depressed because you allowed those thoughts to hold you captive. 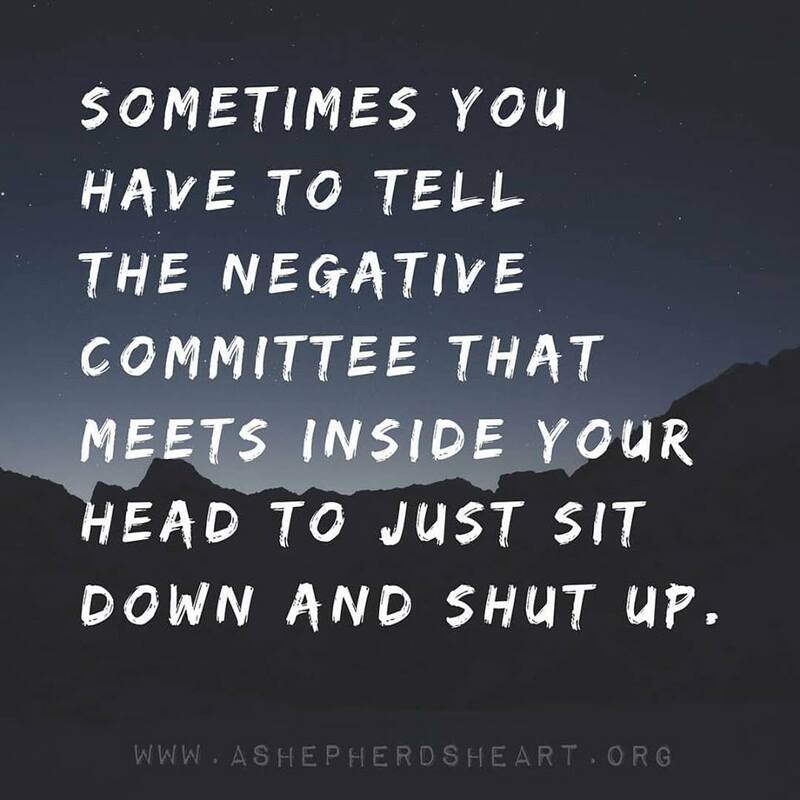 We need The Lord's help to stop the vicious cycle of negative, destructive, life sucking thoughts that we're allowing the take up residence in our heart and minds and the thoughts are living there rent free! to have or keep in the hand; keep fast; grasp. to bind or make accountable to an obligation. an act of holding fast by a grasp of the hand or by some other physical means; grasp; grip. a controlling force or dominating influence. Similar to the definitions we need to act in obedience by taking hold of our thoughts as God instructs us to do. This is something we cannot be passive about because it's by His strength that we can hold our thoughts captive and submit them to Him! 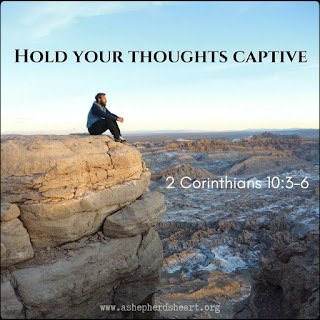 Furthermore, if we don't hold our thoughts captive someone or something else will certainly try to hold our thoughts captive by filling our minds and hearts with junk that we just don't need and we don't need to dwell there! In the process of doing this thing called life, we need to allow God's Word to saturate our minds and dwell on those things and the things above instead of the negative thoughts or the chaos we face at times. In the name of Jesus, it's time to serve the eviction notice to those thoughts! Don't let your thoughts hold you captive any longer, instead, take your thoughts captive in Jesus name and give them to The Lord as He will shine the light separating the truth from the lies!